Review: After being away for seven years Batman comes back to Gotham City to fight corruption. Brilliant start to the Batman trilogy. 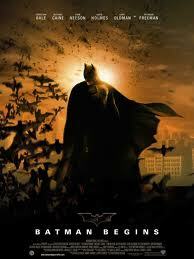 The second film is The Dark Knight and then followed by that is The Dark Knight Rises. Thought that the script was well written and also thought that Christopher Nolan has done a fantastic job directing this film. I found Cillian Murphy to be really scary. Very dark and only suitable for children aged 12 and over. Viggo Mortensen was first approached to play Liam Neeson’s role but turned it down. When all the cast were sent their script they were not told that it was going to be a Batman Movie. Throughout this film Batman is only said 10 times.